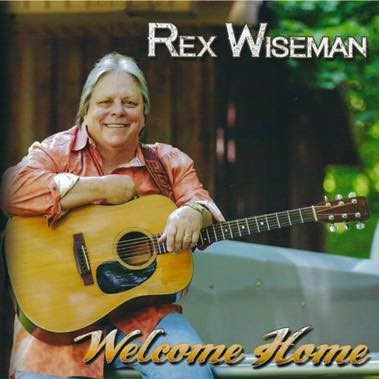 If you're a fan of the Oak Ridge Boys, then you already know who Rex Wiseman is and that he is quite literally the consummate country musician. Name an instrument, he plays the heck out of it and if he doesn't play it, he'll learn. His heart beats music, the notes and melodies run through his veins. He stands behind the Oak Ridge Boys every night as a longtime member of the Mighty Oaks Band, singing, playing and well, being Rex. Now, Rex has stepped into the studio and released his own CD, "Welcome Home." This CD has been in the works for quite awhile and I was lucky to have watched this go from dream to reality for him. This CD is 14 tracks of some of the best "new grass" music performed by Rex and some of country music's biggest names including the Oaks, Dailey and Vincent, Jimmy Fortune and Rhonda Vincent and penned by some of the best writers in country music such as George Jones, Dean Dillon, Scotty Emerick, Skip Ewing, and others. This CD is a surplus of talent and if you're a fan of bluegrass or traditional country complete with pedal steel and fiddles, you will NOT be disappointed. This CD delivers a recital of amazing instrumentation, vocals and story telling that come together in the perfect way. This CD will help you find your way home. If you would like to purchase a CD, email dixiedawgrecords@gmail.com and you will be sent an invoice in the amount of $20 + $3 shipping with a Paypal link to confirm your purchase. The CD is also available at the merchandise table at any Oak Ridge Boys show. Rex's website is currently under construction.